It’s Contest Time. Are You Feeling Lucky? Bramble Berry just added a new line of finished cold process soaps. All you have to do is the cutting and packaging (which is the fun part). We have 9 different fragrances and colors to choose from (naturally, they’re the most popular fragrances and essential oils we sell). Buy a single test bar or the entire loaf. We have 4 all-natural soaps that are scented with our Essential Oils: Hungarian Lavender, Lemongrass, Peppermint (2nd), and Rosemary.Our other 5 bars are scented with our best-selling Fragrance Oils: Energy, English Rose, Oatmeal Milk and Honey, Sensuous Sandalwood and Vanilla Select. This is the perfect opportunity to add an authentic, handmade soap to your product offering without having to deal with the hassle of Lye and the 6 week waiting time for the soap to cure. Create an entire gift ensemble or coordinated product line including lotion, liquid soap, a bath bomb and real, handmade soap. Leave a comment and let me know what fragrance and color you would like to see us carry in the next line of finished cold process soaps. On May 29th, I’ll choose a winner (or 2) at random to win 5 fabulous bars of handmade soaps from this new line or a full loaf of one of the fragrances. So I ask the question again: are you feeling lucky? Next Post: "It was … VERY intense"
~Oh, I must add one more thing…..
& WOW that's a lot of comments!! I would like to see vanilla and turkish moca scent with pearl mica swirl. I have made it before with goat milk CP soap and it is wonderful! Definitely patchouli or a patchouli blend. EO would be great, but I know it’s still killer expensive. But that’s what my customers are looking for! Patchouli, rose, and ylang-ylang. I had a body spray of this variety a long time ago, and I LOVED it. Perhaps a pink swirled with brown and white. A coffee soap would be a huge seller — everyone loves waking up with the scent of coffee! My favorite soap is oatmeal and lavender. A light tan with small, pale purple dots would be pretty. Tie it with a thin matching purple ribbon and the perfect gift you will have…. there was a fragrance called basil lime once carried by Bramble Berry and I would love to see that in a shave soap..my family misses it. coconut cream( a lovely creamy colour.boring,i know!) or pina colada ( a bright yello and cream combo ) would be lovely! Well, you know I would have to vote for Mango Lassi but I’m sure you’d have to change the name first like we talked about in email. Mango Sunset! Yeah!!! hehe…but anyway, I wish everyone could smell it. I can’t decide between two, so I’m going to cheat. I love the Wasabi fragrance and as for a design, I like swirling but I think Wasabi should go with a cleaner, more geometric design. Such as a thick green stripe in the middle with white on either side, or even half green and half white. My other (current) favorite scent is Patchouli Orange. Patchouli by itself is expensive and I think using Orange will help lower the cost a little, plus this combination smells delicious. I would go with a burnt orange swirl on this one. My new favorite scent is Cranberry fig mixed with a hint of tangerine EO it smells fantasitc and is a great seller for me. A color combo of red w/ orange swirl. I also love your ginger lime light green and dark green swirl. I would like to see something that smells clean and fresh. I love Salty Mariner and Wasabi or an Aloe or Green Tea fragrance. The colors could be swirled green and beige or white. What a fantastic idea! I like all of them. I’d like to see a nice mango-coconut, maybe white and orange like a creamsicle. I think a lovely cream-colored bar with the Island Coconut scent would be a fantastic addition to the line! How about lavender with a touch of clove! That sounds fabulous! Since this is the start of summer, I’d love to see my version of Hawaiian nights, a mango, coconut blend, with a hint of vanilla and if you are really feeling decadent you can also add a bit of pikake flower. I envision either a sandy beigh or a pale blue bar with swirls of orange and a deep pink, maybe even a darker blue added in there too. stormy, exotic, swirly, mysterious black and lavender. i am trying in M&P and have had some interesting results. another big one for me is sea moss..
swirls are lovely but anyway they come out will be a dream! Lemongrass with avocado oil is always a favorite of mine with a soft green color (maybe a green and white swirl). vibrant smells & varied colors of the Rainforest. A soap with hues of blues, emerald, fuschia, lime & orange. Scented with Ylang Ylang 111 E.O.known for (quote) its ability to lift spirits, promote relaxation, enhance sexuality,sooth panic, anxiety & calm nerves. Very much needed in these times of depressing world economy & dwindling self confidence. I’ve gotten pretty attached to the Bonsai fragrance lately. You definitely need to add that to your collection, and try it in some soap. It’s got a little zen-like quality, very good for a spa, and it’s really unisex so everyone can use it. Plus it lends itself to great colors–greens and tans/browns. I’ve gotten a little sculptural with it. My whole work space smells wonderful for days after I make it (unless I make something else in between). Oatmeal/Honey fo is my favorite. I think a swirl with a light brown and a slightly darker brown would look so natural and would sell well – at least they do for me. Your soaps are by far the best in many ways. I am into the plain smells – straight lavender, orange or strawberry. I would like to see you have something that is guy friendly, but not musky. I love if you could come up with a “fresh shaven and showered” smell. Gardenia in a white/green color combo? I love natural soaps and LOVE citrus but am unable to get a citrus to hold – like a grapefruit-sweet orange??? CHOCOLATE!!! I make chocolate soap, usually in the Melt & Pour and it is fabulous. It looks and smells chocolate. I also do a chocolate/coffee bar that is excellent for use in the kitchen when cooking or after doing dishes. So, I want to see you offer CHOCOLATE SOAP! I love the sandalwood scent so I would continue that! I’d love to see a Soapy Clean as one! Maybe a stark white with soft blue or soft green swirl. Gingerfish would be great too, with yellow and green swirls! I’d like to see a Patchouli EO soap, simply because I hate having to make that one myself! A rust colored paprika swirl would be pretty! The current offerings are gorgeous, BTW! That would be a really bright and cheer-you-up-in-the-morning soap!! I just made some Wild Raspberry & Vanilla Bean w/shea butter soap base … Oh my, my! Smells fabulous..what a combination. Swirl in Red Mica and Sparkle Violet Mica all by Brambleberry. I love Patchouli…..that would be a fabulous one to make! How very cool! You guys are making this way to easy for people to sell soap as a home business! lol. Orange Spice. I had more compliments on this scent then any other scent I used in CP soap over the holidays. It looks great with a 2-part swirl of orange and plain w/apricot kernel powder. Guys seemed to like this scent as well. new limited edition Coconut Citrus Sorbet fragrance. Both of these make for a wonderful summer fragrance! And summer is upon us. I think adding a touch of lavendar essential oil/fragrance to either of these would add a nice touch as well. As for the color, I know both of these fragrances turn soaps a little brown. But adding maybe a yellow or orange swirl (or both) would be very summer-like! Also, I think adding a little exfoliant to this soap would be great. Given that during the summer, or any season really, we all need a little exfoliating now and then to keep our skin looking its best. By adding a small amount of apricot seed powder or cranberry seeds to this soap, I think it would make an excellent bar of soap! oops! I didn’t mean to be anonymous! Wow! Look at all these great ideas!!! I love your Blackberry Sage! You could color it with titanium dioxide, purple passion and emerald green. Thanks Anne-Marie for the contest! I would love to see a vanilla/orange scent – the soap could have orange and white swirls – kind of like an orange Dreamcicle ice cream treat! I’d love to see a Blackcurrant soap with a pretty red, burgundy and white swirl. Island Coconut. The colors should be a mix of island colors. Sand brown and ocean blue. I love the “Relax” fragrance, and would definitely buy a bar or two of that. My first encounter with handmade soaps was an amazing smelling almond bar. I would definitely go with almond in maybe a cream with peach swirls. One of my favorite scents is Brambleberry’s Woodland Pear. My customers love it because it’s a unisex scent. I would swirl this one, w green and white or green with brown to give it an earthy look. I would do a patchouli scent with a nice green/dark green swirl. Or a psychodelic swirl! Purple with brown and black swirls, but it would have to be just the right shades so the colors are distinguishable. If black is “too much”, then sub. a dark green. I would Love, love, love, to see Pomegranate! I’ve used Pomegranate in my bath bombs and bubble bars and all of my customers just love it! Its such an exotic smelling fragrance. Diff from the regular cookie cutter types. Like the Melons, strawberries, or Vanilla. Thanks Mary Anne for all of your awesome ideas and projects you share with us. Thanks to you I started selling bath bomb cupcakes at the craft shows I do on the weekends and people cant get enough of them! I always sell out. Thank you thank you thank you! Brambleberry rocks! I love cammomile maybe in a celery green color swirled into white. So relaxing. I’m allergic to most scents, so I’d LOVE one with NO added scents. You can make it pretty without being scented. I bought an almond oatmeal honey bar one time that seemed to be OK in the shop, but made my eyes water and nose run on the way home. I set the bar outside for a few days and then it was mellow enough to come inside. I guess it was the almond fragrance oil that did it. I’ve experimented with about 4 different essential oils and those ones give me allergy symptoms, so I’ve not included those in my soaps. I’m also hesitant to experiment with more EOs as they’re expensive and I don’t want to try a drop or two to find out I’m allergic and have to give the bottle to someone else. I’m happy with the feel of the wonderful oils in the soaps. I made a honey oatmeal soap that has a very subtle scent, but just from the honey and oatmeal and oils. So, this is a long story to say NO added scents! Coconut Citrus Sorbet (white with swirls of yellow and orange), Passion Fruit Papaya (orange with swirls of pink), & Sleepy Time (pale blue with swirls of purple) are all scents I would love to see in your soaps! I just got my first shipment of BrambleBerry supplies and I have to say that I love everything, but I especially love the Pink Grapefruit Fragrance Oil! One fragrance I really love is Brambleberry’s Passion fruit Papaya,it is so delicious,I would to see a fresh yet fruity soap loaf in that fragrance.And also perhaps a more masculine one Wasabi,that would be really cool. I cant wait to try the rosemary bars,I love rosemary,reminds of my grandmas house growing up she has a huge rosemary bush I chopped pieces of to play cooking with my friends. Thank you so much for the opportunity to pick a fragrance and also participate in this contest. I absolutely love Plumeria! Reminds me of sitting in a fields of wildflowers. It’s a great floral scent for any age. Colored with pink and lilac tones…Perfect! How about a coffee/coconut combo? It’s different but smells sooo good. Summer Fling, its time for florals. This is one of my always best sellers and I just call it Fling and color it wildly. What a great idea! Ideally, I think it would be great to see a new scent for each season as it rolls around. I would like to see a citrus for the summer, a spice for the fall, a forest scent for winter, and a floral blend for spring. I only sell soaps with EOs, but I would consider selling these seasonal soaps in FOs, if that’s all you offered. Wow, these soaps look great! My personal favorite is real Cinnamon with a hint of orange and lavender. In our house we are also crazy about the scent of the Vanilla and Peppermint that you used for the Mother’s Day items! I tried a jasmine scented soap once and it was awesome. I personally prefer uncolored or natural looking soaps so I can’t really say on the color thing. Hi Anne-Marie! Lemongrass with your Egyptian Geranium would be amazing. Swirls of your Labcolor for high pH colors Bramble Berry Magenta and a touch of Lemon would look beautiful. I really love your Fresh Cut grass smell. A nice swirly green bar would do. 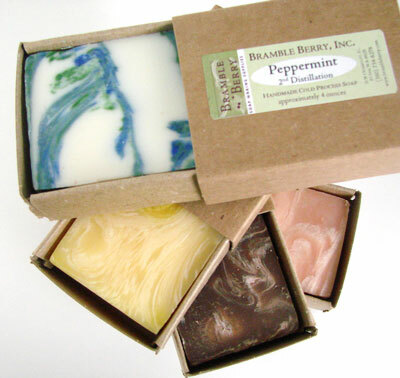 Love the swirly soaps – so pretty. My vote is for anything citrus – orange/vanilla etc. You could also have a cocoa mint offereing with a brown base and white swirls. Ok! Swirly white+teal+soft lilac, with the scent of sage and a tiny hint of mint!! This is an awesome idea! I really love how the soaps turned out. Soft, wispy swirls in colorful bars that are sure to delight the senses! I love musk but don’t know if you can use it in soaps. Oh. My. Goodness. You are are rocking the good ideas. I am in awe of your blending ideas and completely enthralled by your suggestions. Keep ’em coming, please. Vanilla Peppermint.Yum. Tingle. Sweet. Alive. 2 kinds of lime, a sweet one for women who like candy type fragrances and a more masculine one for the guys.Both with lime green swirls. tropical summery scent, cause it is the season. what a fun line to add to your already wonderful line, congrats Anne-Marie! Oddly enough, after experimenting with oils to blend into my mother’s lotion – Grapefruit and gardenia complement each other very well, without being cloying. I love Lavender and when it is mixed with just a drop or two of mint it’s even better. I would love to see that combination. I also love Kumquat. It’s such a bright fresh scent! I love the ocean…So how about grapefruit and juniper berry with a little sea kelp for texture. Fresh and Crisp. Dragon’s Blood with a bronze swirl. Of course, Vanilla Bean with a super pearly white swirl works well too. I’m crazy for your pomegranate and mad for your mango. It’s summertime and I’m all about fresh fruit. All my friends and family love the kumquat scent in my soaps. It just screams wake-up. I would love to see that in a soap. I LOVE your Coconut Lemongrass fo. Its great for men and women and works great in cp soap. With my best Clint Eastwood accent : Do I feel lucky? Well, do I ? I would love to see a scent combining lemongrass or lemon verbena, tangerine and a touch of vanilla (or potentially chocolate). Exotic eh? Color would ideally be a lime green with lighter yellow and pale streaks. I suppose a Sandalwood scent (or blend) would be high on my list. It appeals to men and women alike. I am feeling lucky so here goes…I would love to see a soap with a citrus scent (lemon/lime), a jasmine scent and a combo lavender,ylang ylang scent. Maybe something for the guys…kind of woodsy or clean. I would love to see a Lilac. Lavender colored loaf with deep purple and white swirls. Maybe even a little gold mica. Second choice would be the Pineapple Cilantro, yumm! I see a white loaf with bright yellow and dark green swirls. So many choices, what fun! I would love to find a sweet cinnamon soap that doesn’t irritate sensitive skin. There wouldn’t have to be a ton of cinnamon, maybe a spicy chai or cinnamon roll would be perfect. I love cinnamon but even Indigo Wild’s cinnamon soaps leave my skin all itchy! Cinnamon Sugar in a swirl!! You already have my 2 faves in there (peppermint and vanilla). Another great scent would be a citrus blend! I would love to see a moonlight pomegranate with black and a deep red swirl. Thanks for having a contest. Your new soaps look fabulous. I like the sound of Sun Ripened Raspberry with a rose color and white swirl or the Moroccan Mint sounds good too. Maybe a brown with green swirl. How about a nice cucumber melon for summer? I recently made soaps and bath gel with the fragrance oil you currently carry called SEA MOSS. A friend of mine was getting married and she wanted to add the soaps and bath gel to a welcome basket for her guests. Sea Moss is such a nice unisex scent, its clean and fresh. I think it would be a great addition to your line of cold process soaps. As far as the look if it, when i smell it i think of a nice afternoon on an island after it has rained. Ivory with differnt tones of greens is what i think off. Needless to say the soaps and bath gel were a hit. people really enjoyed the scent. keep up the great work Anne-Marie and thanks for giving everyone an opportunity to try your soaps. I would also like to see a light blue Hello Sweet Thang, maybe with some type of purple swirl? I’m all about the spice. I love clove, and I love sandalwood and vanilla – I wonder what a blend would smell like? What about a spicy combo? Ginger, cinnamon, nutmeg. Living here in North Dakota we don’t always have nice weather. I’d like to see something tropical and refreshing. That way for those of us with cool weather can enjoy some time spent relaxing trying to block out the cold (especially in the winter when we need to forget its -30 out) to take us to somewhere warmer. At least for a few minutes we can sniff and be taken down memory lane. Either from our own experiences or from a photo we have seen or from a scene from a movie. I’d personally love to see it in an aqua blue and white swirl. To remind ourselves of the beautiful tropical waters in the shallows on the shore side of a coral reef that attracts so many people. Well those are just what comes to my mind at first when I read your request. I make a lot of my boys’ soaps fragrance-free and color-free because of their sensitive skin, so I like the idea of a color-free and fragrance-free soap. However, my absolute favorite FO is called Sweet Innocence. This is the description from the supplier: “A delicate fragrance with clean top notes and nuances of lavender. Heart notes of classic jasmine, musk and a delicate rose. Woody powders, vanilla, sensual warm, sleepy notes make this a traditional baby fragrance.” I picture a soap with beautiful swirls in soft colors/pastels. Thanks for the opportunity to win some fabulous soaps! I personally am in love with Jasmine right now. But I like anything with Lavender and Rosemary…how about some EO blends. I only do frangrance-free products. I’d like that added to the ready-made cold process line. I would love to see you offer a Beau Brummel scented soap in swirls of grays and black and white. mmm-mmm!! WoW!!! Thanks for the opportunity to win one of your fabulous soaps! What would you say to the idea of Mango-Mango paired with Lime Coconut Verbena? Maybe swirls of orange/beige/lime??? I would love to see you offer Sweetgrass in a green and white swirl! Brambleberry Sweetgrass is my favorite. I think that a cotton/clean scent would be fabulous like in light baby blue! I'd like to see an eo-scented soap with warm patchouli & a hint of spicy floral rose geramium. sounds, rich, decadent & wonderful! I love clove essential oil, its deep and warm and when paired with tangerine or citrus, makes a fantastic bar of soap! Plus brown and orange would be a really neat color combination! i would love to see something used with the cream cheese frosting oil because that just sounds so good to me!! I would like to see you do a geranium because that is my absolute favorite scent. So I suppose I’m a bit bias but I love it so much and I want to see what your geranium smells like because I would love to buy it but all geraniums are a little pricy so I’m trying to finish up the one I have before I purchase some more. Thanks for the opportunity. I know you have a lavender already, but my new favorite scent is lavender/orange. A purple/orangge swirl would be pretty.